Chad D. Schmidt Schmidt was sworn in by Assistant Judge Wesley Mook in Bennington Superior Court in of September of 2009, replacing the retiring Sheriff Gary Forrest. He recited the lengthy oath and promising to uphold both the Vermont and U.S. constitutions. His wife, Jaime-Lynn, and their twin babies were present, along with other family members, Forrest and law enforcement officials. The Department currently has 23 cruisers - which consist of Chevrolet Impalas, Crown Victorias, Ford Expeditions and Chevy Luminas. The Department also has 2 Prisoner Transport Vans as well as 2 snowmobiles for winter forest patrol. 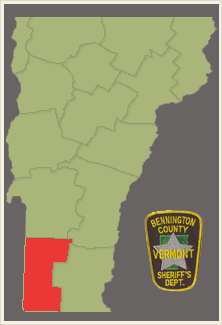 The Bennington County Sheriff's Department has a rich history in Vermont. Originally founded in 1781 by Sheriff Jonas Galusha, the department had no means of funding until 1986 when Gary J. Forrest was appointed Sheriff by Governor Kunin. Gary J. Forrest served as Sheriff from 1986-2009 building the modern day Bennington Sheriff's Department. The Sheriff has worked hard to build a department that has deep reaches in the County. In September of 2009, Chad D. Schmidt was sworn in as Sheriff, replacing the retiring Sheriff Gary Forrest.